Pre – Shipment / Factory Inspection. Organization, Control, & Security checks (Storage or Trans shipment facilities such as warehouses etc. Project cargoes, Heavy lift, Steel etc. Consultancy Services: Specialist advice or reviews on Particular topics of relevance (Particular Cargoes, Contracts, Financial Standing etc. Container Stuffing and De –stuffing. Discharge & Delivery of Bulk/Liquid cargo. ? Pre-Shipment Inspection of Automobiles. ? The Core activity of Wilson’s in India & Nepal is the survey of cargo. The low standards of reporting in this high volume, rapidly developing, marine market were causing problems for our clients, cargo insurers and brokers. In recognition of the need for skilled and professional cargo surveys in India, Wilson’s undertook to provide an unrivalled service to cargo insurers, globally. Establishing the nature, extent and cause of damage or loss is the second part of the claim management concept and involves the survey of the damage cargo or investigation of theft-related losses. Due consideration has to be made for increasing standards and requirement (e.g. Civil Procedure Rules) which require parties involved in transportation claims to protect their legal position and produce sufficient evidence of their claims. The surveys are performed either by Wilson’s in house Surveyors or specialists instructed for particular cargoes or situation where relevant expert knowledge is required. Our surveyors traditionally cover the area of India & Nepal boundaries. In other regions we co- operate with the Global Network of Lloyd’s Agents. Before proceeding to the next stage, the result of the survey or investigation are summarised and relayed to the client in the form of preliminary report. These cargo survey reports reach the top of the international standards of cargo reporting. Internal recovery expertise and international recovery experience ensures that the reports protect and enhance any recovery potential. According to client requirements Wilson’s will either do a standard cargo survey, or a survey plus adjustment. Wilson Surveyors and Adjusters Pvt. Ltd. offer its client an effective claims management services. You benefit from this approach being able to handle claims and identity loss prevention potential quickly and efficiently. An effective reporting and communication system within Wilson’s keeps you up to date with all development in a familiar language. Our aim is to reduce your losses and claims expenses with effective, value for- Money survey and investigation. 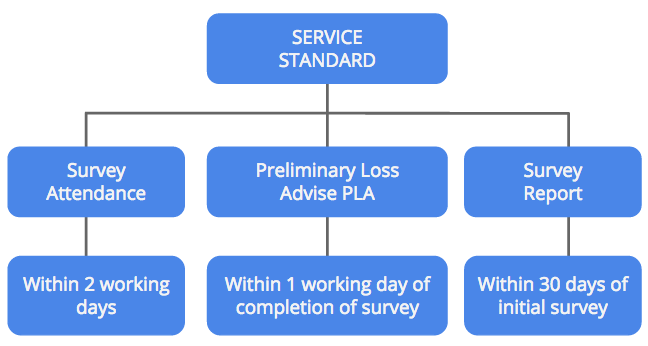 Audit of claims and repair costs. Procurement and analysis of claims documentation. We ensure that the claims are documented and adjusted properly by professionally qualified and experience personnel. We Advice to the consignees wherever necessary, to take step to protect and preserve the rights of recovery against parties responsible/liable for the loss. Wilson is also one of the leading companies within India engaged in claims recovery and defence which has become of increasing significance over the last few years. Many of these cases, however turn on their facts. The comprehensive Wilson’s Claims management product comprising survey & investigation together with the handling of loss by the Wilson’s Claims department can assist you in enhancing your chances of increasing recovery and defence potential. International Standard Services. ? Extensive Global Network.